Originally, this room was a corridor which had been constructed in the 17th century by adding a half-timbered wall in front of the Palace. Since 2011 the room has housed examples of traditional regional costumes. In a large showcase as well as in various paintings, one can admire the costumes worn in and around Feldkirch during the Biedermeier era. However, the main focus of the exhibition lies on the development of the women`s headgear. It is demonstrated by the artfully handcrafted base bonnets (“Bodenhauben”), the gold lamè brocade bonnets up to the gold lamè circular headpieces (Gold-Radhaube), the attribute of the upper-middle class women of the towns in the Rhine valley and around the Lake of Constance. Oil paintings of middle class men and women from Feldkirch bear witness to the clothing worn during the late 18th and early 19th centuries. 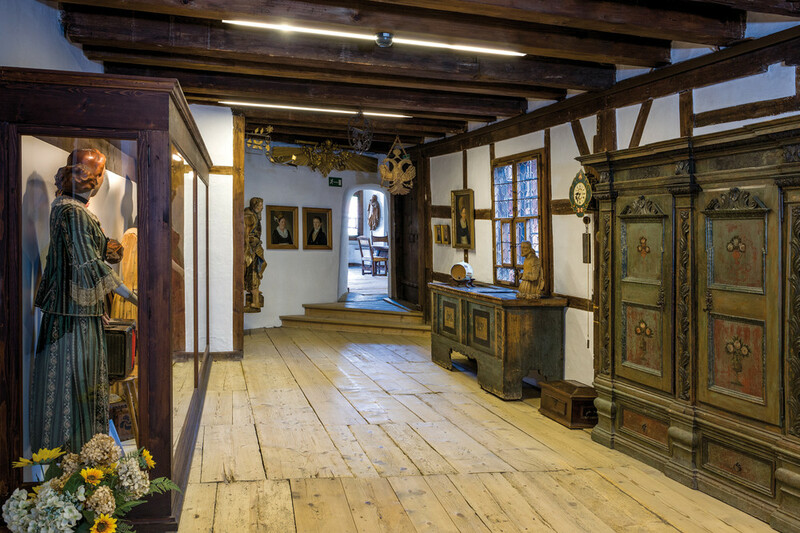 Opposite the showcase are various chests and cupboards once belonging to Feldkirch middle class families from the same era. The official sign with double-headed eagle, orb and sceptre hanging from the beamed ceiling most probably originates from one of the many governmental offices in Feldkirch. Vinegar jars like the two displayed on the chest of drawers were part of almost every local household. Outside of these opening hours, guided tours for groups are provided all year round. In any case, all groups - with or without a guided tour - are required to register their visit!